Spring/Summer collections are always on a lookout for new fabrics to develop new styles. Cottons, Viscose and Rayons have been summer staples since years and exporters have now started putting pressure on choosing new fabric options. With runways pitching in new fabric ideas and designers experimenting with new fabric mixes, four types of fabrics have appeared to be in the front line. These fabrics are being used in variety of applications. Becoming huge favourites with designers and now picked up by export product development teams, the following four fabric choices are becoming the talk of the industry. Amid varied technological advances, fabric manufacturing has also touched new heights, and with customer’s growing need to wear something new season after season, fabric manufacturers have tried and developed many new versions. One such version is the knitted adaptation of our own archetypical denim. Indigo knit denims are made in more or less the same way as denim. Being a knit, knitted denims have more elasticity, comfortability and flexibility in comparison to normal woven versions. Being almost negligible in the last few seasons, suddenly exports and buying houses have been noticing the growth of burnout fabric, a.k.a. brasso in the upcoming season. Joyline Pvt. Ltd., a buying house dealing with brands like Dunnes, River Island, Zero, M&Co, Penneys and Primark, has been receiving enquiring about using brasso fabrics in the S/S ’17 collections. “We are in the process of sampling for S/S ’17 season, and till now, all the mood boards we have come across, have one thing in common in terms of fabric options – brasso. As the season is moving away from laces to find a better replacement in terms of cost, brasso is the fabric type to look out for, along with brilliant aesthetics,” says Shalini Singh, Assistant Merchandiser of the company. Tweaking the basic brasso technique to suit their collections, designers surfaced a wide range of garments in magnificent interpretations. In the S/S ’16 collections, Lela Rose, showcased a variety of polka dots and ikat striped motifs in brasso on floor-length dresses and skirts. Michael Kors presented a range of skits in brasso which created the trompe-l’oil effect of embroidery. Regarded as the most preferred knits in summers, due to its airy structure and construction, Jersey is used predominantly for summer clothing manufacture. Named after the island of Jersey, the fabric was originally made of wool, but is now created with cotton and synthetic fibres as well. Jerseys are very stretchy, made using single knitting process and are usually light-weight. The most popular application of this lightweight fabric can be seen in regular T-shirts. Ankit Nair, MD, Kanchan International, adding further says, “Other than single knitted, jerseys can be double knitted as well which have less stretch and is heavy as two single jerseys are knitted together to form a double jersey, which is the most popular amongst other varieties of jersey fabrics. Jersey is considered to be an excellent fabric for draped garments, such as dresses, and women’s tops. “Some common uses for jersey fabric include T-shirts and leggings. The fabric is cool, flexible, stretchy, and very insulating, making it a popular choice for the layer worn closest to the body. Jersey also tends to be soft, making it very comfortable. 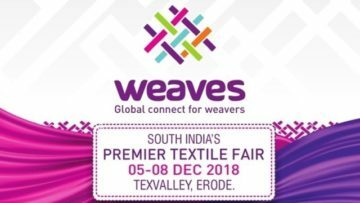 Scattering the beauty of its handmade nature, crochet is still being carried out by hand, even after the launch of varied machineries in the industry. Anil Sehgal, Proprietor, Suneeta Knitwears, praising the uniqueness of this technique shared, “Crochet is our forte and today the products are selling fine owing to the technique’s exclusivity. It takes about two months for completing 6-7,000 pieces by hand. Though similar work can be replicated by machines, but the difference is quite noticeable.” With an experience of more than three decades, and working with top retailers under the brand ‘Apsley’, Anil has observed an amazing growth in demand of crochet-based apparels.